Prince Nicolae Petru mavrogheni (1786-1790) ctitorise "Out to the field, on the outskirts of Bucharest", beyond the head of the Bridge of Mogoşoaiei (the current path of Victory), a complex of buildings that would surround the ruler's Summer Palace. This complex consisted mainly of 3 buildings: the "kiosk" reigns with the related "Chambers", the monastery church and the monks ' barns, namely the "water Treasury", i.e. a reservoir in which the water captured on the Olanas, which then refueled a herd For the use of the Lord's House, another for the use of the "circumstances of the slushers" and a gushing fountain. To these were added three windmills a new Obor "Where to come the inhabitants with those who have for sale" as well as a garden from which later will develop the park Kiseleff. 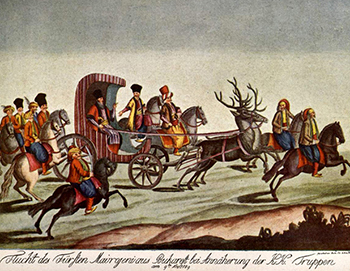 The "Mavroghenesc" Ensemble gave the name of the neighborhood known as "the slum of Mavrogheni's", as it appears in Catagraphy from 1810 and other documents from the 19th century. 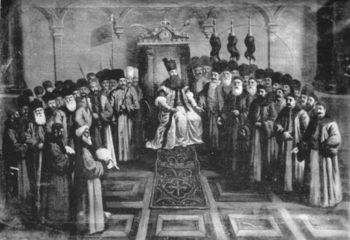 Since the reign of Nicolae Petru Mavrogheni, in addition to the monastery, a printing house has functioned where emblematic works were printed for national culture, a school, and a hospital called " Philanthropy "(of the love of people) who keep up the same name today. The Edilitary Opera of the ruler Nicolae Petru Mavrogheni had an ephemeral character. 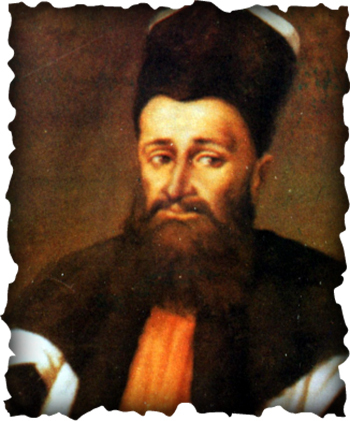 Of all the Mavroghenesti settlements, the only one who kept the memory and the name of his founder is the church. The cult of worship was built in the course of the year 1787, receiving, from the foundation, the "Spring of Healing", as well as the trickling that had been placed under the protection of "The troubles of God and the Virgin of the Sea." 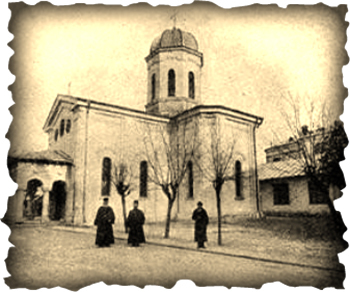 Prince Nicolae Petre Mavrogheni worshipped this church to the Ecatontapiliani monastery ("The One with 100 portals") of its native island, Paros, the foundation of the Holy Empress Elena, mother of St. Constantine the Great. In the reign of the ruler we encounter this urge to the followers: So we pohtim and those of you, the Gentlemen of the Lord, who will pity God with the lady of the same Christian countries to be willing to shelter, to enhance and to protect these as some that have been found, committed, and put into deed, and their blindness. And as we have toiled and made them again, so and their little brother, with love to guard the things that have been made., to follow and stand in their state, being given the benefit of the obit, that we may be together share in remembency after the word of the Holy Gospels that say : “And the first mercy and the latter heal. " The Bierica "Healing Spring" Mavrogheni suffered over time several damage caused by earthquakes, fires or wars, which imposed extensive restoration and consolidation work, sometimes going until the initial architecture was changed. Today, only the Catapeteasma, a unique piece both as architectural value and as an artistical style, also reminds of the old place, built in Baroque style.